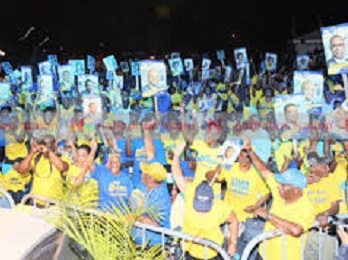 BRIDGETOWN, Barbados, May 21, CMC – Barbadians go to the polls on Thursday to elect a new government amid growing economic concerns and the possibility of choosing a woman for the first time to lead a government in this Caribbean Community (CARICOM) country. “We have done this country proud over the last 10 years, we have had to govern Barbados in the most challenging decade the western world has seen since the great depression and we have managed to not only keep Barbados stable but to ensure that those basic amenities to which Barbadians have become accustomed were made available to them on an uninterrupted basis,” said Prime Minister Freundel Stuart, 66, who is leading his ruling Democratic Labour Party (DLP) into a general election for the second consecutive occasion. But his main challenger, Mia Mottley, 52, an attorney, who heads the main opposition Barbados Labour Party (BLP), has dismissed Stuart’s record of achievement, telling voters that she is prepared to implement the stringent policies, including taking the island to the International Monetary Fund (IMF) in a bid to turn around the ailing economy. “I said it before that we would do whatever is necessary, that is legal and moral, to rescue this country. Does that mean going to the IMF? It may, we don’t know. But when we get the results in the first few days (of taking office), we will be able to make the judgement,” said Mottley. The Central Bank of Barbados (CBB) earlier this month said that the local economy had contracted by an estimated 0.7 per cent during the first quarter of this year and warned that the outlook “remains challenging”. CBB Governor, Cleviston Haynes, in a review of Barbados’ economic performance in the first quarter of 2018, said that the performance reflects the combined impact of a decline in real output in the tourism sector, the slowing of construction activity, the late start to the annual sugar harvest and the slowdown of domestic demand arising from the budgetary measures announced in the May 2017 budget. The CBB said that while the supply of foreign exchange was more than adequate to meet market demand on a timely basis during the quarter, “higher public sector debt service obligations than usual contained the growth of international reserves at the Central Bank to BDS$14 million (One Barbados dollar = US$0.50 cents) for the period”. The Central Bank said that decisive stabilisation measures that place the public finances on a sustainable path, alter the trajectory for the international reserves and create the conditions for strong durable growth are now needed in order to deal with the challenges ahead for the local economy. But Stuart maintains that his administration has done much to revitalise the economy and has warned voters not to take a chance with their future. 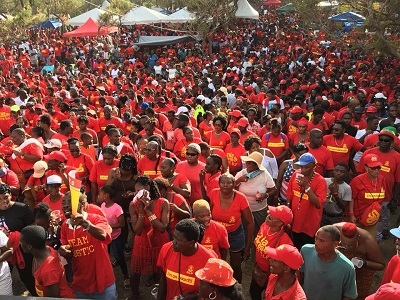 “Having said that Barbados is in the poorest state that it has ever been in, since Universal Adult Suffrage or since Independence, the Barbados Labour Party is now coming to give the impression to the people, that the same Barbados that is on its knees, can afford all the give-aways that they are promising. “Mia Mottley has stood up in the House of Assembly on many occasions and said that the problem with Barbados is that we are running a government that we cannot afford. And although we can’t afford it, according to her, she is now coming with measures that would require us to spend even more than is being spent now. But, spending more by earning less,” he told party supporters. 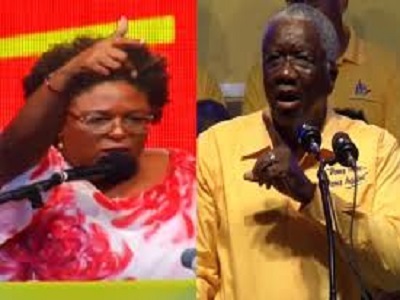 However, Mottley, who is aiming to emulate the late Dame Eugenia Charles of Dominica, Janet Jagan of Guyana, Portia Simpson Miller in Jamaica and Kamla Persad Bissessar of Trinidad and Tobago in heading governments in a predominately male dominated Caribbean political landscape, insists that “change is in sight in this country. “I have not come to lie to the people of Barbados, I have come to talk to you and with you . . . . All that we have seen is that Freundel Stuart would do anything to be able to say that, ‘I did not go to the IMF. I did not carry Barbados to the IMF,’ she added. The election here on Thursday is already historic for more than one reason. Stuart himself said that “history is not made by things happening the same way all the time” and that it is “made by doing things differently” as he defended the decision not to name a date for the general election when the Parliament was automatically dissolved earlier this year. “I did not dissolve it deliberately and of course, the experts have been giving expressions of their surprise. This is the first time in Barbados history that a Parliament was allowed to stand dissolved by the effluxion of time, that is how history is made,” he said. The 2018 election has attracted a record 135 candidates representing various political parties and independents. There are 37 women and 98 men and for the first time in Barbados political history, two political parties, the BLP and United Progressive Party (UPP) are being led into an election by women. However, despite the increased number of political parties and candidates, only the DLP and the BLP have nominated candidates to contest all 30 constituencies, with some such as the Barbados Integrity Movement (BIM), fielding just one candidate. The courts have also featured in the run-up to the general election. Commonwealth citizens, who have been resident here for more than three years went as far as the Trinidad-based Caribbean Court of Justice (CCJ) – Barbados highest court – seeking to have their names included on the voters list. 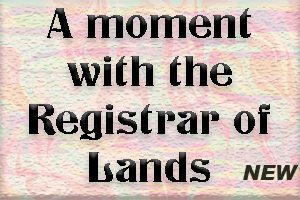 “The long standing policy of the Electoral and Boundaries Commission in relation to Commonwealth citizens to register as electors … is unlawful and ultra vires. The Court is satisfied that on the basis of judicial finding pronounced in this matter, which has not been appealed, the applicant has satisfied the necessary legal and regulatory conditions for registration as an elector,” The CCJ ruled, threatening to jail the Chief Electoral Officer, Angela Taylor, if she failed to obey the ruling. No public opinion poll has been released here, less than 96 hours before the general population cast their ballot at the polling stations across the island. But political commentators say that history does not really favour the DLP in the election. They noted that never in the history of this Caribbean island since it attainted political independence from Britain in 1996, has a government failed to obtain anything more than a 10-year term in office. Director of the Barbados-based Caribbean Development Research Services (CADRES), Peter Wickham, who has conducted several polls throughout the region, told the Caribbean Media Corporation (CMC) that, while no official poll has been commissioned, he believes there will be a change in government. “Historically, the Barbados Labour Party has on average received a four to five per cent swing and if they are able to get at least that as an average performance historically, you looking at an additional four to five seats. “But my sense is that they will get considerably more than a five per cent swing,” he told CMC, noting that there seems to be widespread support for Mottley in succeeding Stuart as the new head of government. But he also acknowledged that if the DLP is able to “mitigate that swing and achievement any improvement in its fortunes it would create history in as much the same way the BLP did in 1999”. Stuart came to office after succeeding David Thompson, who died on 23 October 2010 and three years later, Barbadian voters kept with tradition and provided the incumbent DLP party with a second consecutive term in power following a nerve jangling general elections. On that occasion, Stuart’s DLP won by a 16-14 margin, defeating former prime minister Owen Arthur, who has now warned that regardless of which political party forms the new government on Thursday, stringent policies will have to be implemented to resuscitate the ailing economy. “There are fundamental issues concerning the economy that Barbados has to address: I do not think that people quite appreciate what is the importance of the last report of the governor of the Central Bank,” Arthur, 68, one of the longest serving prime ministers, told a press conference. The BLP is promising not to devalue the island’s currency, leaving it pegged at the exchange rate of two dollars to one United States dollar. However, it has said that the strategy for boosting foreign exchange reserves would have “many facets. “We will prohibit the Central Bank from printing money without parliamentary approval. We will allow all who earn foreign exchange to keep foreign currency accounts in local banks. We will attract new inward investment through a range of of policies including developing Heritage Bridgetown as a Smart and Creative City…we will incentivise the private sector to build new islands off Barbados,” the party has promised in its manifesto. For its part, the DLP is promising to reduce the tax burdens on citizens by “growing the economy. “As the economy grows, tax collections from wages and salaries and from the sale of goods and services will increase. Government revenue therefore rises without further increases in tax rates. Sustained growth in the economy and in tax collections will enable government to actually reduce tax rates over time,” the DLP said.